Real newsprint snapped by @topgold with Lumia. I SPEND SEVERAL Sundays every month combing through the Sunday Times and Sunday Business Post for news related to interesting items. Then I insert half of those papers inside the complimentary copies of the Sunday Independent that I find at my local McDonalds. But before I do that, I make an audio clip about the most interesting snippets. The clip is below this post. I've discovered many of my very busy friends have given up personal copies of the Sunday papers because they have The Twitter to bring them The News. That premise works a little for me but not when it comes to the placement of copy and the advertisements. I've watched the paper copy of the Sunday Business Post adopt red ink on the front page along with a big block of text about an insert inside. That front page design feels dirty to me but I think it probably sells more papers. Another observation from today concerns the most expensive item that appears to be cross-promoted across the Irish Sunday papers. That would be the Audi premium collection (the things I call used cars). The front page of the Sunday Times contains results of an investigation into English language schools. It turns out the schools often lie to ensure their students can work longer hours. That's been happening ever since Ireland discovered its language immersion courses were more attractive than similar options in England the United States. The defection of Pat Kenny from RTE was a seismic moment in Irish media, writes Betty Purcell. I think 2014 marks other changes in Irish media too as broadcast rights change for sport fixtures. I feel for the thousands of Irish graduates Leanna Byrne portrays in the 1500 words she gets on the Opinion page of the Sunday Business Post. "So here we are, living in the 'experience' economy. The 20-24s are the deadweight, and the employers are the charitable gods that take us under their windgs. The under-25s are now expected to do their time in the playpen before entering the real jobs market. Either that or you have to 'build character' overseas and come back to us when you've made an asset out of yourself." One solution might be for the Irish government to reduce or eliminate PRSI contributions for Honours graduates they hire. This could mean a new hire costs several thousand euro a year less when considering the tax break from the Revenue. 1. 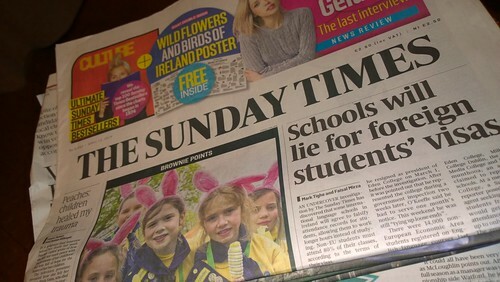 Mark Tighe -- "Schools Will Lie for Foreign Students' Visas" on the front page of the Sunday Times, April 13, 2014. 2. Michael Sheridan -- "Last desperate call from co-pilot's phone" in the News section of the Sunday Times, April 13, 2014. 4. Emer O'Kelly -- "Arts Council Must Look Beyond Crowd Pleasers" in the Sunday Independent, April 13, 2014. 5. Elaine Burke -- "Hub gives education-tech start-ups masterclass on how to move on up" in the Technology section of The Sunday Times, April 13, 2014. 6. Scandinavian Shop -- "Menu 350 Lighthouse Lamp" for £65. 7. Leanna Byrne -- "Degrees of Alienation" on the Comment & Analysis page of the Sunday Business Post, April 16, 2014.